This is a beautiful and moving piece. It has an honesty that is inviting on many levels. What a wonderful piece! 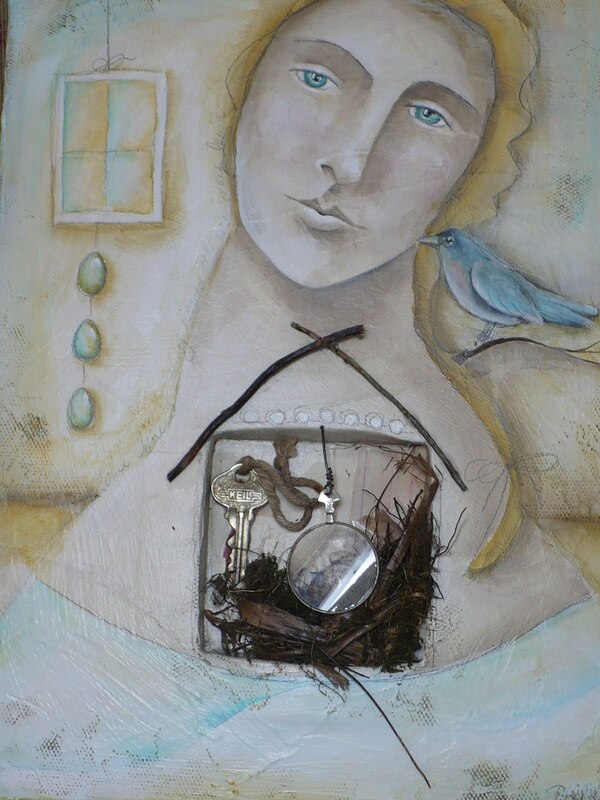 I love the idea behind it of a personal shrine on a portrait and I love all things bird! i simply love how you incorporated nature into your art piece. Hello Pam,It's a small world afterall…I received an invite to participate in an art exchange. I happily agreed to this and today I made my piece to send to the name at the top of the list- your name. I wrapped it up and put it in a flat mailer to mail out to you tomorrow. Then tonight I went to Borders to get my new issue of Somer Set Studio and there in the letters to the editor is your name again besides some awesome envelope art. It was rather sureal for me to me to see your name there tonight after just today seeing it for the first time – anyway…I'll be sending out your art tomorrow! all the best,Elizabeth http://www.allthingspaper.comlove your art, but the way! my cloth paper scissors magazine arrived yesterday afternoon. congratulations on your article! great great job. i'm so proud of you! Pam, I received my copy of CPS the other day and always check the Table of Contents first to see which one of my "sisters" is published…..immediately turned to your pages and WOW….what gorgeous work 🙂 Can't wait to settle down with the mag and read the article. Love this portrait work, too….won't that retreat be grand ? Ahhhhh…. I love your work and reading your story, Pam. Keep sharing your journey! Love that you will be teaching a retreat. Where would this be?Love your new piece.